I must beg your indulgence for this post because today it’s all about SPACE CRUISER YAMATO 2199! SPACE CRUISER YAMATO 2199 is basically a reboot of SPACE CRUISER YAMATO, the classic 1974 animated science fiction series from Japan (a.k.a. STAR BLAZERS in the U.S.). I blogged about my obsession with Yamato last year if you need a refresher on my relationship with this swoon-worthy show. The reboot will begin airing in Japan on April 7, 2012. All I can say is, OMG Squee OMG! Goodness gracious me, words can not express my love for Yamato. I love it more than STAR WARS and STAR TREK put together. I’ve watched the television series and films more times than I can remember. I collected show paraphernalia and for a time became deeply involved in Yamato fandom. For many years I even dreamed about the show—in color! Most importantly, I’d spin daydreams of Kodai and Yuki in their own science fiction romance adventures. And now I get to relive the experience all over again! The original series will always be my favorite, but it will be *so cool* to watch this show in an updated animated style. 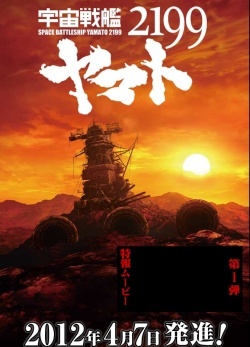 This has been a great couple of years for Yamato, what with the live action film SPACE BATTLESHIP YAMATO in 2010 and now the reboot of the original series. And if you think my fangirl squeeing is bad now, just wait until I’ve seen the live action film and the show reboot! Is anyone else out there looking forward to SPACE CRUISER YAMATO 2199? For those of you new to this series, would the sophisticated animation of the reboot compel you to check it out?